For a large, wide corridor that connects bustling Union Square to Washington Square Park, University Place in the northeastern pocket of Greenwich Village is a surprisingly quiet street. 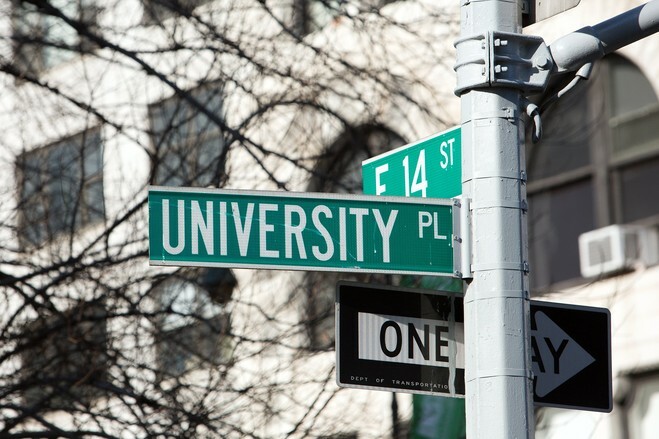 Although many residents and students from the New School and New York University can be seen walking around, the intensity of the crowd and traffic quickly dissipates once south of 14th Street. There’s more activity taking place on the side streets off University Place these days. Between 12th and 13th streets in particular, many developers have been busy converting old parking garages and other former commercial buildings into large, multimillion-dollar luxury residential units. Ms. Hult Elghanayan is one of the brokers marketing new homes at 37 E. 12th St., which will have six units, including a duplex penthouse with more than 6,500 square feet of interior space and 1,000-plus square feet of outdoor space. Once it is completed in the summer, there also will be four floor-through units and a triplex townhouse. Prices in the building, developed by Edward J. Minskoff Equities, will start at $9.35 million, and Ms. Hult Elghanayan said she has gotten many inquiries from those who already live in the neighborhood. A contract for one unit that is over 3,000 square feet with two bedrooms and a wood-burning fireplace is expected to be signed any day with a buyer already living in the area, she said. Official sales are scheduled to start in about a week for units in another building at 12 E. 13th St., a former parking garage. It is being converted into eight condominium units that include a 5,700-square-foot triplex penthouse. Richard Cantor, a principal at Cantor-Pecorella Inc., the firm marketing the units for developers DHA Capital and Continental Properties, said initial inquiries have come from neighbors, but also include empty-nesters from the tri-state area looking to live in the city after raising children in the suburbs. Other area offerings include a condo building with seven floor-through units and two penthouse apartments at 17 E. 12th St. from Rigby Asset Management. Unlike many other pockets of the Village, developers can build high structures on some streets in the University Place area that aren’t part of a local historic district.Andrew Berman,executive director of the Greenwich Village Society For Historical Preservation, said the organization is trying to mobilize local support for a rezoning plan covering several streets on and around University Place and Broadway that city officials left out of surrounding historic district borders. This action was spurred by concern over a large tower that is currently planned to replace the former Bowlmor Lanes and adjacent parking garage at 100-110 University Place. Early plans for the mixed-use development by William Macklowe Co. filed with the city Department of Buildings call for a 23-story tower with 52 residential units and for about 13,000 square feet of commercial space. “We would like to see the area rezoned so future development requires a more contextual approach,” Mr. Berman said. A Macklowe spokesman declined to comment. Meanwhile, the area’s dining scene is also seeing a jolt of new activity. Shuko, a new restaurant that offers seasonal Japanese omakase tasting menus, opened with much fanfare on East 12th Street late last year. This follows the opening of All’onda, an Italian restaurant, and Cork Buzz Wine Studio, both on East 13th Street between Fifth Avenue and University Place. 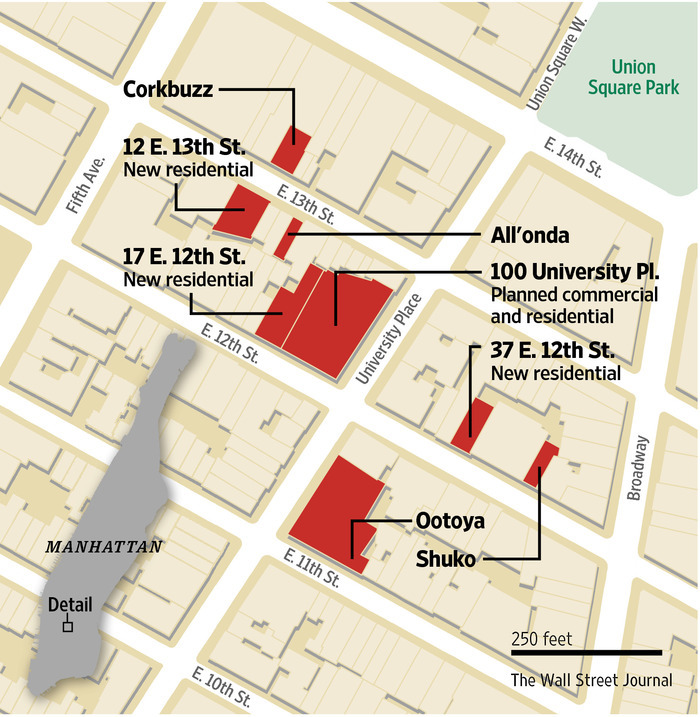 The Japanese restaurant chain Ootoya is also getting ready to open its third city location on East 11th Street soon. Chris Jaeckle, chef and owner of All’onda, said he had looked for spots in the East and West Village before signing the lease on this bi-level space. Some long-established neighborhood restaurants are pleased with the new additions. 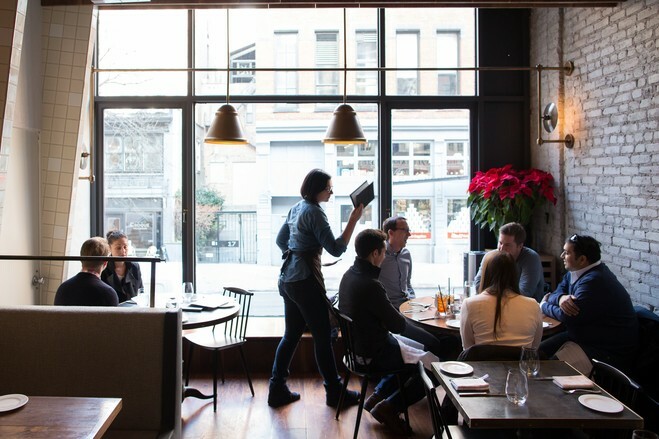 He said the restaurant’s business lunch crowd, especially from the publishing industry, has declined over the years as many companies relocated, only to be replaced by new neighborhood regulars coming in for a more leisurely lunch. Things have shifted around, but I like that 12th Street is evolving,” he said.